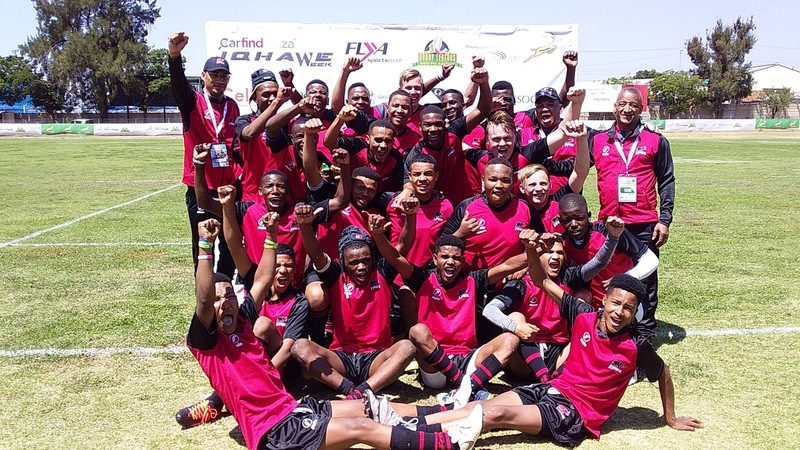 Eastern Province took top honors in the Carfind.co.za Iqhawe Week at the Bill Jardine Stadium in Johannesburg on Thursday as they defeated the Golden Lions 18-10 in a competitive final match, which brought down the curtain on an exciting 2018 tourna-ment. The Carfind.co.za Iqhawe Week, which opened this week, on the 1st October, is part of SARLA’s broader mandate to achieve true transformation and social upliftment within rugby as a sport. 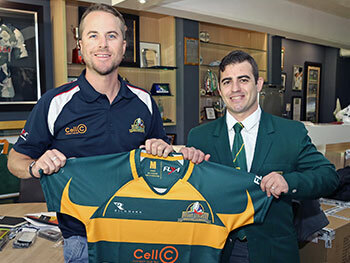 A joint initiative with SA Rugby, it brings together U15 teams from the 14 rugby unions across South Africa. 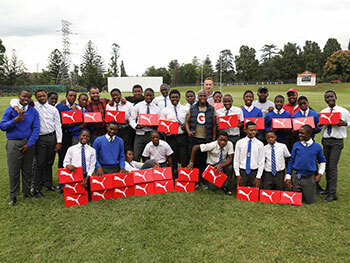 The 2018 edition proved once more to be an amazing showcase of young rugby talent, with many players from non-traditional rugby playing schools and under-privileged, rural areas taking part, treating South African rugby fans to a total of 21 exciting games. The boys from the Eastern Cape began strongly with a try by Serue Serue and penalty goal by Wessie Odendaal earning them an immediate 11-0 lead. This was then chal-lenged by the host team, the Golden Lions, who bounced back, retaining possession late in the match, thanks to a converted try and penalty goal by Mzwandile Dube. Eastern Province held rank and fans witnessed Serue crossing the tryline for the second time on the stroke of fulltime, which sealed the victory for them. What a thrilling game! In the second-half, the Griffons delivered some strong skill, resulting in an outplay to the Griquas with a score of 40-17, after the teams entered the break level at 12-12. Such was the high quality of their attack they scored six tries, with Marcus Stols contributing a brace, while Daniel Crouwkamp kept the scoreboard ticking with five conversions. An impressive presence was felt from the outset by the Leopards against Border as they built up an encouraging 24-5 halftime lead. This was build on in the second half, increas-ing their try tally to five which resulted in a comprehensive 31-12 victory. Standout per-formances by Isaac Muchanga and Bukho Ngxakamba steered the team to a victorious end. Watching the Sharks against Boland was another encouraging experience with regards the growth of our country’s young rugby talent. The Sharks were in solid form against Bo-land, and really made excellent use of their try-scoring opportunities as they touched down three times. This was backed up with a good kicking performance to earn a 25-7 victory. Western Province also finished their game victorious by defeating the Pumas 23-10 as they outscored the Mpumalanga outfit three tries to one. 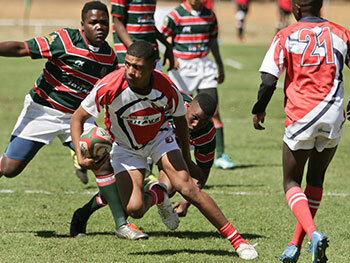 More talent was revealed in young Mandiluve Matsoyiyane who scored two of the Capetonians tries, while Coun-lee Koekman slotted over a conversion and two penalty goals. A top performance of defense was noted through a brace by the Valke’s Keagan Kochs, paving the way for their 21-5 victory against the Free State. The first half was tight, with the Valke talking a narrow 7-5 lead but they crossed the chalk twice more after the break, and managed to shut out the boys from Bloemfontein. The clash between the Blue Bulls and SWD was gripping, with the Pretorians’ edging their way to a 22-17 victory. Both sides scored three tries but Byron Jansen’s extra con-version and penalty goal proved to be the difference on the scoreboard. Overall it was an extremely encouraging and successful edition, revealing once again that the hard work of SARLA and supporting partners is paying off with year-on-year growth and talent identification. Twenty years ago, South Africa’s professional rugby players created MyPlayers to represent their interests and ensure that they are, and continue to be, active role players on all levels. Through MyPlayers, essential issues such as players’ rights, career planning, finan-cial services, medical aid, pension, insurance and more receives the attention re-quired. In addition, 2018 saw the creation of a bursary realised through a percentage of all players income, enabling a talented young player to receive the best education and support (such as the essentials and necessary kit, funds for tours and more). MyPlayers believes that education changes lives and is inspired by SARLA’s contin-uous work in supporting the next generation of young rugby heroes. Financially supported and endorsed by SA Rugby and the Gauteng Provincial Govern-ment, the event is hosted in partnership with the City of Johannesburg and MyPlayers and has in previous years seen many great wins, on all levels.